Today Jay Shafer is featured in a video on Yahoo today talking about the benefits of living simply and in small spaces. If the idea of living in less than 100 square feet sounds crazy, I’d like to point out that McMansions are the fad; people have been living in tiny houses since we moved out of caves. As Jay points out in the video, a lifestyle of simplicity frees up our time and money. Taking on large mortgages and vast amounts of unused square footage doesn’t typically pay us back in the way we had hoped. Many of us who have traveled down that path, are instead left with a bit of an odd sense of loss and the weight of debt. For those who aren’t ready for extreme downsizing, or who are stuck where they are, I hope that you can still take away the idea that Tiny Houses are Icons of Freedom. They are low cost and attainable. As you visit the pages on my blog you’ll find many stories of people literally building their own secure futures with their own hands on very limited budgets. Join Us on Facebook – Get started by following us on Facebook & Twitter. Subscribe to Tiny House Design – I regularly blog on tiny houses with an emphasis on do-it-yourself projects. 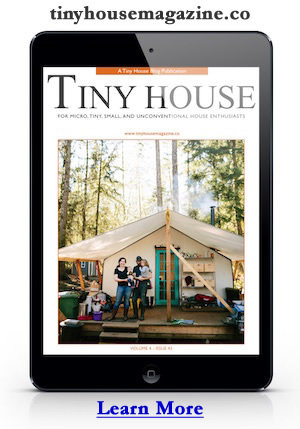 Subscribe to Tiny House Design for regular updates. Small House Book by Jay Shafer – I also highly recommend that you pick up a copy of Jay’s book. You’re in luck because they are running a promotion right now and giving away set of free tiny house plans when you buy the book. Visit the Tumbleweed Tiny House Company for complete details. Tiny House Blog – Another great blog on Tiny Houses. Below is a sample floor plan from the Popomo Tiny House Plans. This entry was posted in Announcement and tagged jay shafer, tiny house, tumbleweed tiny house company. Your second sentence, second comma should be a colon. I had to read this sentence three times before it made any sense. Actually, that second comma should be a semicolon. seems a shame to waste that space in the corner of the kitchen and under the bed. i wonder if you could shoehorn that into an airstream body? Hi, just need some input. I LOVE the tiny home, have for along time and seriously thinking of starting on purchasing a trailer. Than I start to think why not just get an RV?? Help please with pros and cons, thanks Deb. Most of the tiny houses you see here are constructed like a regular house, with 2x4s, thicker insulation, and heavier than the typical RV. Many are built on trailers that are typically much more heavy duty than the RV trailer. The tiny houses also tend to have things like composting toilets, larger showers, more windows, and other features not found in an RV. In all, it is to make it more like a home than an RV. There is nothing wrong with getting an RV either. Those could be considered the earlier versions of tiny houses on wheels. As with everything, there are trade offs to be made. Time of building and costs of a tiny house can exceed a basic RV, but there are also expensive RVs out there too. Time for the next person to weigh in on the pros and cons of the tiny house vs RV. Tiny houses are built like houses so they are heavier but can be much more comfortable through 4 seasons. If you need more portability an RV trailer is probably better unless you can build a super lightweight house. I have just begun to look into The Tiny Home videos and I love them. I am looking forward to then possibility of building one some day. However, the one problem I have with this new Pompano floor plan, it that the bathroom empties into a Kitchen. Those 2 rooms can’t mix in my book, I know it sounds OCD but there is too much of a chance of cross contamination. Jusr saying. But its a nice plan otherwise.